Hi, I have been writing codeigniter tutorials series for quite some time and already discussed about creating login form and contact form in codeigniter and bootstrap. One of the primitive features of any membership website is user registration system. Obviously the common trait of a signup form is to ask for too many details which will scare away users from your site. But keeping the form as minimal as possible will encourage them to sign up easily. 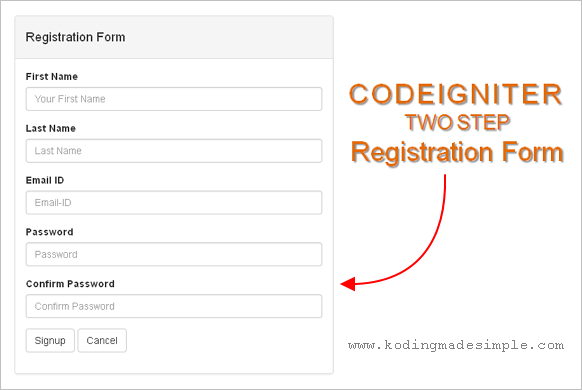 Having said that today I’m going to show you, how to create a simple and elegant registration form in codeigniter along with email verification procedure. The codeigniter registration system we are going to build is a two step registration process namely 1. user registration and 2. user authentication process. It’s common now-a-days to send a confirmation link to user’s email-id during signup and activating the user’s account only when he/she confirms the email id they have provided at the time of registration. By this way we can keep away the spammers and attract only the serious users interested in the value provided by your site. Here goes the flow for our user registration module. 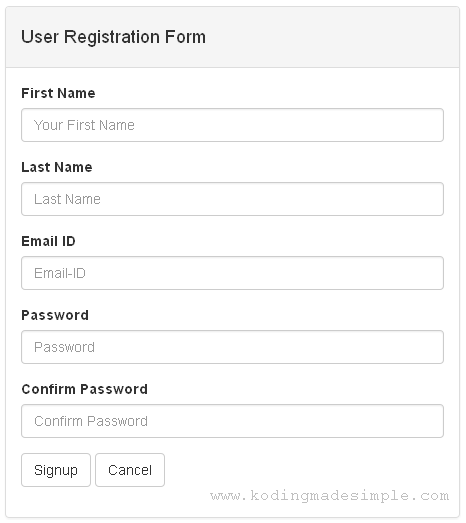 Ask user to fill in the basic details with email id in the registration form. Once validating the user submitted details, insert user data into database. Create a unique hash key and send a confirmation link to the user’s email id. User clicks on the confirmation link and return back to site. Verify the hash key within the link and activate the user’s account. Now we’ll move on to implement the above registration procedure in codeigniter. Beforehand, we’ll create mysql database required to store the user’s details. First create a database named ‘mysite’ and run the below sql command to create the ‘user’ table to save data. The status field is set by default to ‘0’ indicating the deactivate state of the user, and it will be set to ‘1’ for activating the user account once we confirm the email id. Next we’ll move on to creating required codeigniter files for this registration module. Create a model file named ‘user_model.php’ inside ‘application/models’ folder. Then copy paste the below code to the file. 1. insertUser() to save the form data into database provided by user. 2. sendEmail() to send verification email to the user’s email id provided at the time of registration. Here we generate a unique hash key with the user’s email-id and attach it with a link and mail it to the user. Read this tutorial on sending email in codeigniter using smtp to learn more about configuring email settings. 3. verifyEmailID() to activate the user account after confirming the hash key from the earlier generated link. Here we update the status field from ‘0’ to ‘1’ representing the active state of the account. Note: The above mentioned active state of the user will be used during user login process. Check this codeigniter login tutorial to see it in action. Next create a controller file named ‘user.php’ inside ‘application/controllers’ folder. And copy paste the below code to it. In the controller file we have created two functions namely, register() for the first step of the registration process and verify() for authenticating the user. In the register() method, we asks the user to fill in the details, submit it and validate the form data. As I have said earlier, we have a signup form with minimal fields for first name, last name, email-id and password. It’s a good practice to ask the user to re-enter the password once again and we confirm if both the passwords match or not. If there is any mismatch we notify the user with an error message like this. We also confirm if the email-id provided by user is unique and not used already for another account. Codeigniter provides a simple way to confirm this with the built-in validation function is_unique[user.email] where ‘user’ is the database table name and ‘email’ is the database column name to check out. Once we validate the user details and confirm everything is ok, we insert the data into database with the line $this->user_model->insertUser($data). And send the mail to user’s email-id using $this->user_model->sendEmail($this->input->post('email')). For generating the hash key, I have md5() ‘ed the user’s email-id and sent it with the confirmation link. By this way, we don’t have to store a separate hash key in the database for each user. However you can generate a random hash and store in the database for later verification. It’s up to you. 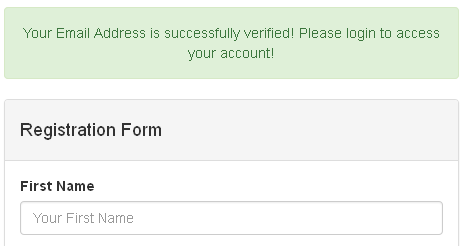 After successfully sending the email, we notify the user to confirm their email-id to complete the registration process like this. Later when the user clicks on the email link, they will be taken back to the site and to the verify() function in the controller. The hash code will be tested against the email id stored in the database and that particular user account will be activated and will be promptly notified like this. We have created model and controller file for user registration. Now it’s time to build user interface i.e., registration form with all the required form fields. For that create a view file named ‘user_registration_view.php’ inside ‘application/views’ folder and copy paste the below code to it. Note: As for the style sheet I used twitter bootstrap css, but feel free to use your own if you prefer. The above view file produces a minimal and elegant registration form like this. As you can see in the view file, I have used several css styles (‘class’) to quickly design this form and those are Bootstrap’s build-in form classes. To display the form validation errors, I have used codeigniter’s form_error() function below the corresponding form input fields. Also the line $this->session->flashdata(); is used to notify success/failure message after registration process. Unlike simple echoed messages, the flashdata message will be displayed only once after the redirection takes place. And that was all about creating user registration form in codeigniter with email confirmation. I hope this two step registration system will be helpful to you. If you have any trouble implementing it, please voice it through your comments. P.S. : For those who faced password matching issues, I have tweaked the validation rules a little to fix it. You can check it now. Verification code not updating data.. I am getting "The Confirm Password field does not match the Password field." error even if typing same passwords! do i need to do anything on user_model.php file??? Hi! It works properly here. Please check if you have any typos with the password field name. hi, same prople with The Confirm Password field does not match the Password field. Just change your code like above. matches need to be put in first element of password, not in last one. I am sorry for asking this nonsense question but I really dont know how to open the page once I set up all above files. Hi! I got the problem when I click Sign Up. It says "Oops! Error. Please try again later!!!" Hi! That error pops up if mail is not sent. Please verify if you have proper smtp settings. Check this below link for right smtp settings. Hi! You need to turn on your gmail setting first. Still not working... what seems to be the problem? i cant demo this simple project, i dont understand, can you give me a tutorial? i cant demo this simple code, can you give me some tutorial? password and cpassword doesnot match. Hi, when I clicked on Sign Up, nothing happened. Can you help me please? Hi! There's some quotation error with the given sql statement. I got it fixed. Please recheck the post now. Hey! There seems to be some error with quotation marks in the provided sql. I got it fixed. Please recheck the post. but im having an issue like the email sent from my site goes into the spam folder in receiver mail. Hi! There is no specific workaround to this. Every email provider have their own spam filtering rules. Make sure the mail sending option is enabled else contact your service provider. Muh. Adi Fahmi, how can i send mails from localhost? Very nice article.if the article explain for lot of new information. Welcome Vignesh! Thanks for your support. Please check this article. This will show you how to configure and run CI files. No database connection settings were found in the database config file. You have not specified a database connection group via $active_group in your config/database.php file. Hi! Refer this link for proper database configuration in CI. i get this error when I click register. Bu tth data is in my db table. Hello, I get the following error but when I check my data base the data is in there. No email sent also. 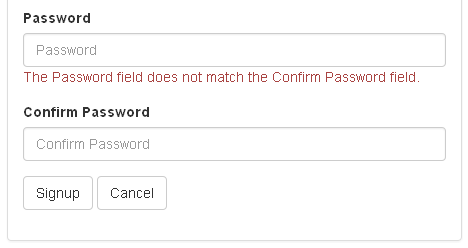 The Password field does not match the Confirm Password field. This is dency from chennai. I have read your blog. Its very useful for me and gathered some interesting informations. I have applied to this. Keep going on. Thank for a good post. Get this error, how to fix it ? the best cognos training in chennai.the best cognos training in chennai»the best cognos training in chennai. Por favor, haga clic en el enlace de activación a continuación para verificar su dirección de correo electrónico. After copying all this code i enter mywebsitename/index.php/user and it shows me 404 page not found.What should I have to do? found very informative articles to learn, added few more information. Hi, thanks for the tutorial. Question: in the code that you provided there is md5 hashing, is it possible a stronger encryption like bcrypt? after completing this how call it into localhost? after completing how i used it into localhost? Thanks a lot very sharing this idea install information is really good.I'll be very like this blog web page. why i got this "The Email ID field must contain a unique value." this source doesn't work. Why? We have to develop blog information for our creativity mind.This blog is very helping for us. Thanks a lot. It's very interesting and useful blog.
" Oops! Error. Please try again later!!! " Why is the sendEmail($to_email) function inside the model and not the controller? Is there an online demo?